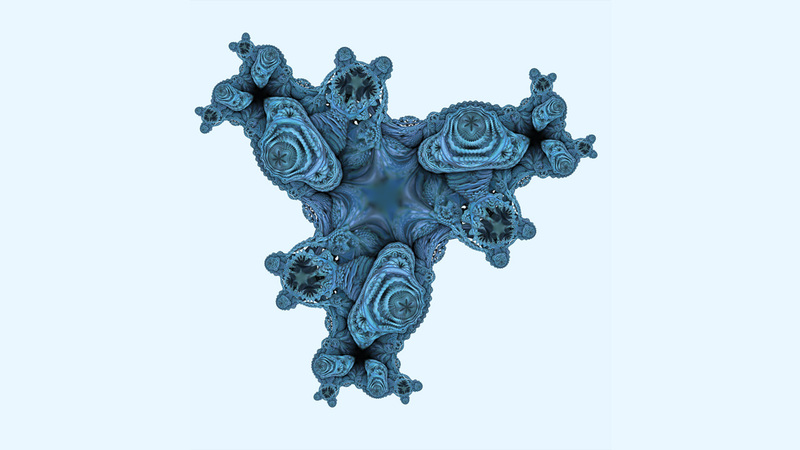 This Photoshop plugin generates complex fractals. 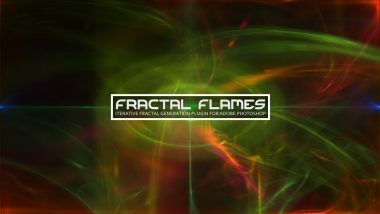 Fractus is the ultimate fractal exploration plugin for Adobe Photoshop. It is capable of exploring the Mandelbrot and Julia set fractals along with their inverse counterparts and exponential powers. 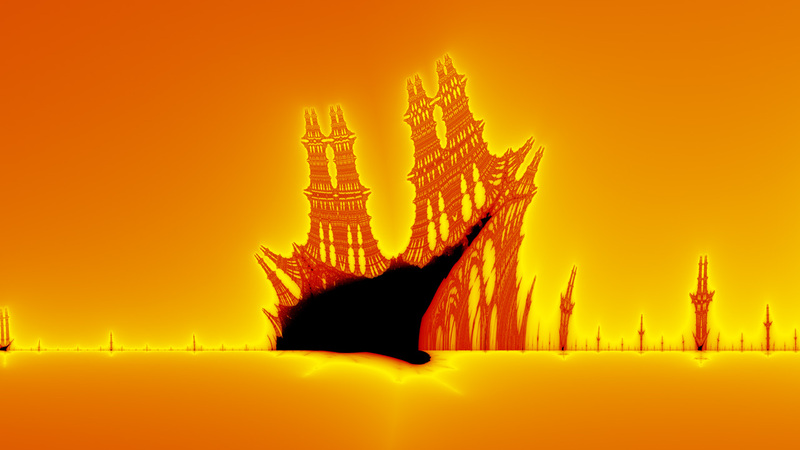 Fractus’ coloring algorithms generate beautiful fractal images with advanced smooth-shading techniques and full anti-aliasing support. The filter is 100% multi-threaded for multi-core workstations and offers 48 bit color capabilities. Fractus supports numerous unique features including fractal-space image mapping (orbit traps), image color palette generation, variable bailout function types and advanced procedural coloring algorithms. 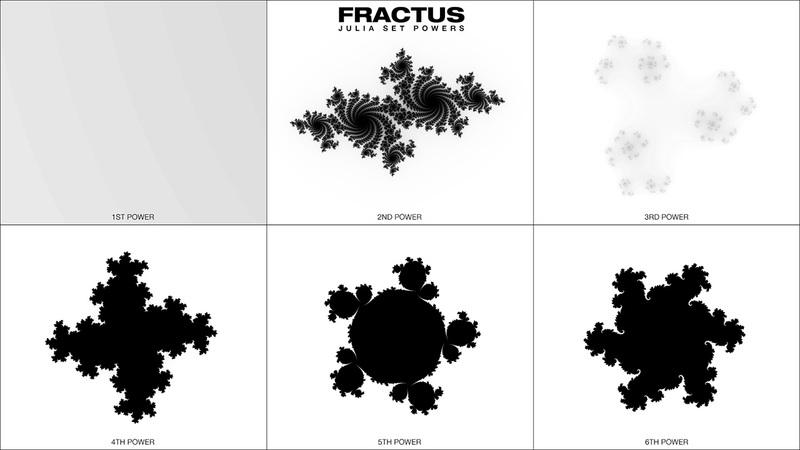 Finally, Fractus is capable of generating extremely high resolution fractals, in excess of 900 megapixels. 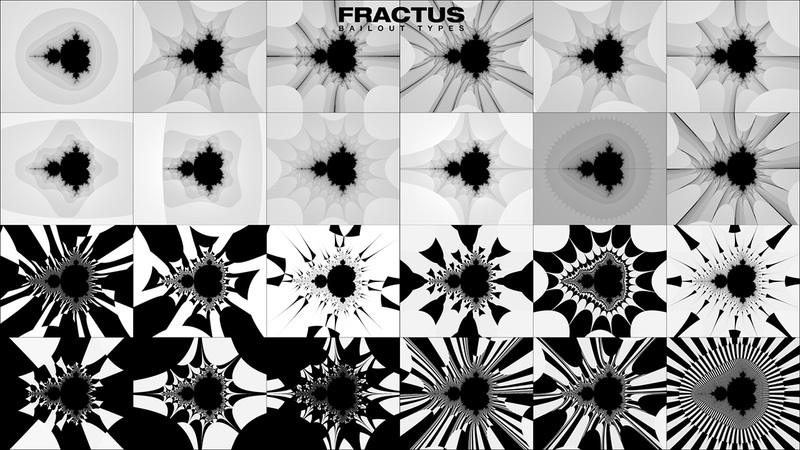 Fractus can be used for a wide variety of purposes but it is an especially useful tool for the creation of generative art for various creative industries including graphic design, motion graphics and illustration. Best of all, Fractus is 100% free. Fractus features an intuitive, easy-to-use navigation system with interactive zooming in the preview or manual coordinate entry. Aspect ratio lock can be toggled on and off and the fractal co-ordinates can be saved and loaded independently of plugin state saving and loading. Check out the gallery to see killer examples of Fractus in action! 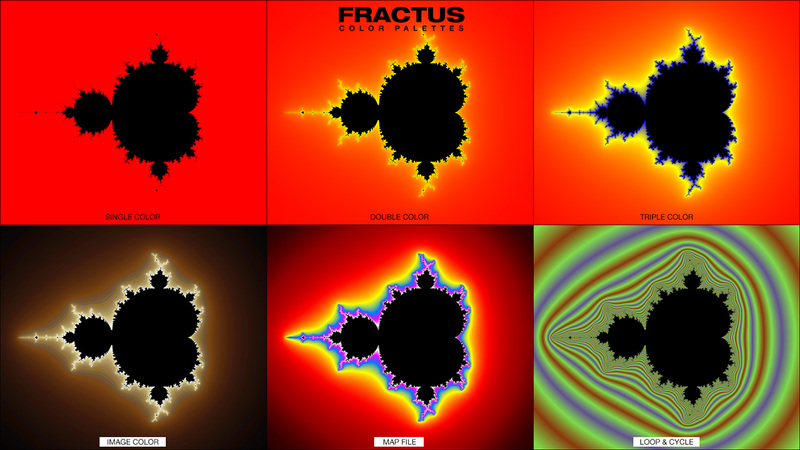 Fractus supports all the common fractal types including the Mandelbrot, Julia, Burning Ship, Tricorn, Inverse Mandelbrot, Inverse Burning Ship and Inverse Tricorn fractals. Fractus has an extremely sophisticated coloring engine capable of shading fractals using numerous techniques. Fractals can be colored by single color, double color, triple color, image color or custom MAP files. Palettes can be cycled, looped, scaled, reversed, inverted or randomized for ultimate control. 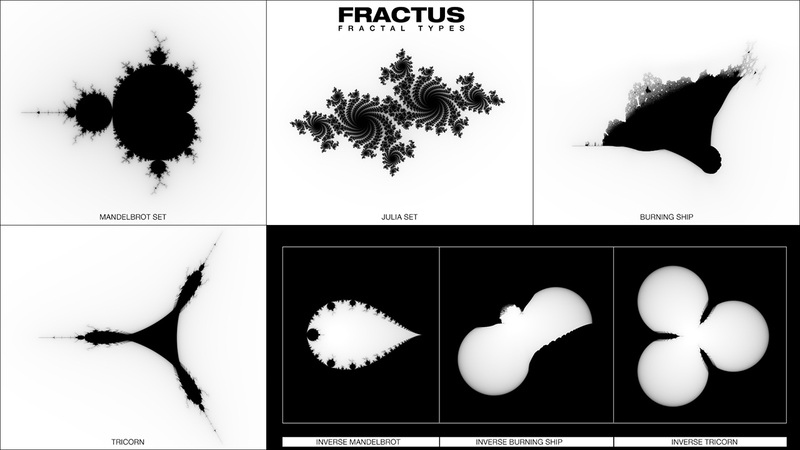 Fractus provides many bail-out options, some common and some experimental, resulting in truly unique fractal designs. 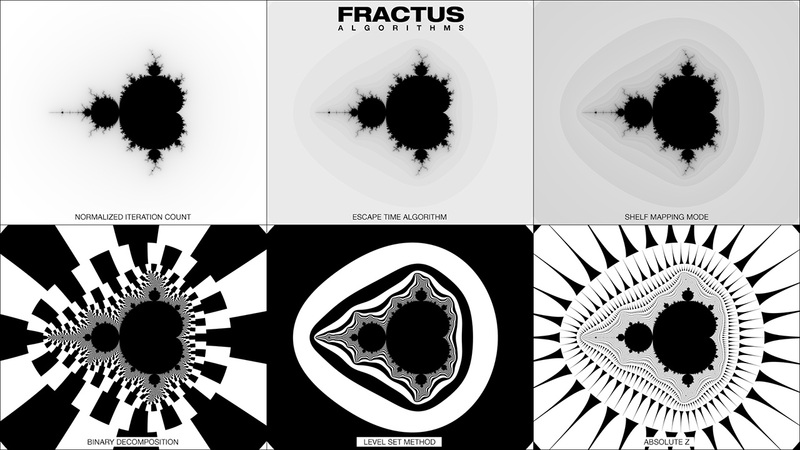 Fractus supports up to 9X supersampling for absolutely gorgeous, cutting-edge antialiased output. The supersampling can be applied to just the preview, just the final render, or both. Fractus supports all the known shading modes including normalized iteration count, escape time algorithm, shelf mapping mode, binary decomposition, level set method and absolute Z. Taking full advantage of Adobe Photoshop’s integration, Fractus features the unique fractal-space image mapping technology (orbit traps) where images can be mapped into fractal space producing fantastic results. Fractal-space image mapping is as easy to use as pressing a button. Fractus offers unlimited coloring options to produce absolutely gorgeous output. .MAP files can be even loaded and used as color palettes! 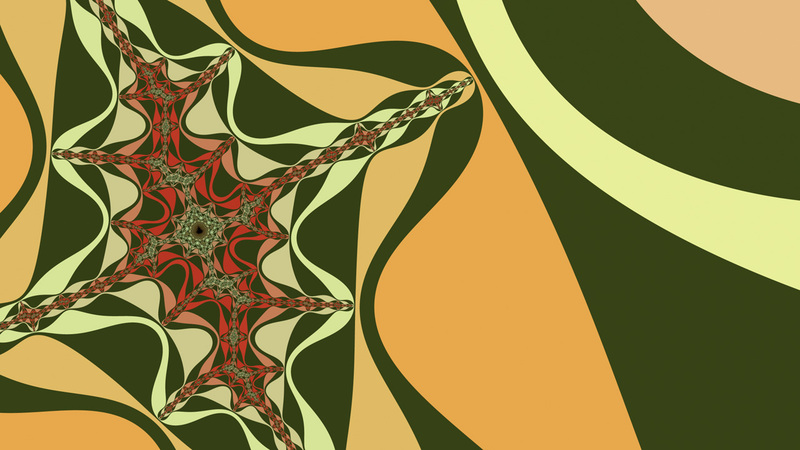 Fractus can even use the source image color palette to shade the fractal with! Fractus is 100% multi-threaded capable of using an unlimited number of cores for ultimate speed. 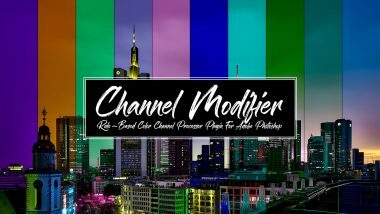 Fractus supports both 8 bits / channel and 16 bits / channel color modes for professional workflows. The Graphical User Interface (GUI) is structured into groups of controls which belong to a logical unit. Individual controls or entire control groups may be enabled or disabled, depending on the settings of other controls. This section contains all the controls related to the fractal’s location, size and mapping. The primary navigation system of Fractus is handled through the preview window. Simply click and draw a rectangle in the preview window to zoom in. Click and draw a rectangle in the preview window while holding the control key to zoom out. Coordinates: These values specify the real and imaginary window coordinates of the current fractal. If aspect lock is enabled, altering these values will result in close, but not exact entries since Fractus makes coordinate adjustments to compensate for resolution aspect ratio. Julia Constants: These values specify the julia set constants. Altering these constants will result in unique changes to the fractal. Since these are universal constants, entering values posted elsewhere should yield the exact same results. 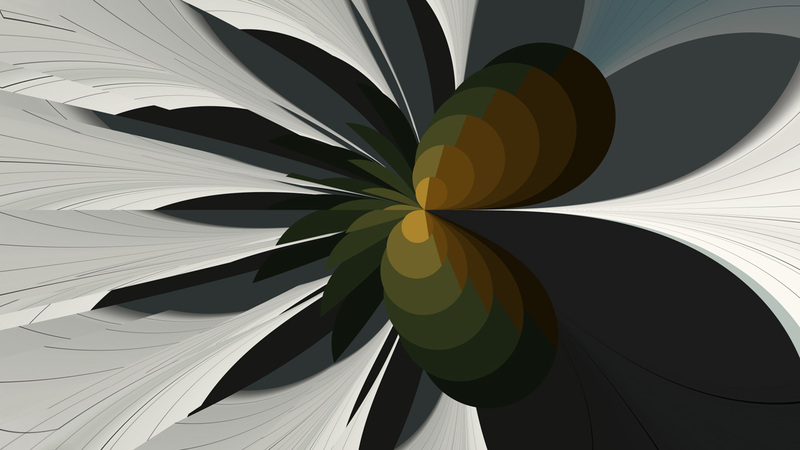 Generate: This button will generate a new fractal based on the currently specified coordinates. This is useful when changing Julia set constants and not wishing to zoom in or out within the preview window. 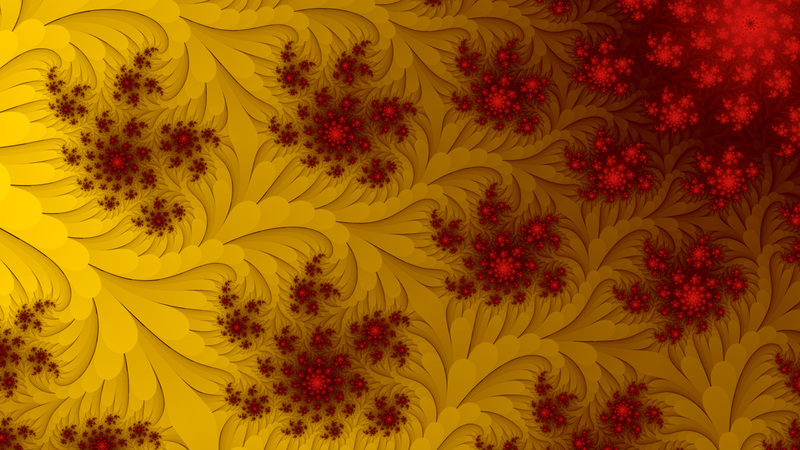 Zoom In: This button allows you to zoom into the fractal. This should not be used as the primary navigation system as it is intended for minor adjustments only. 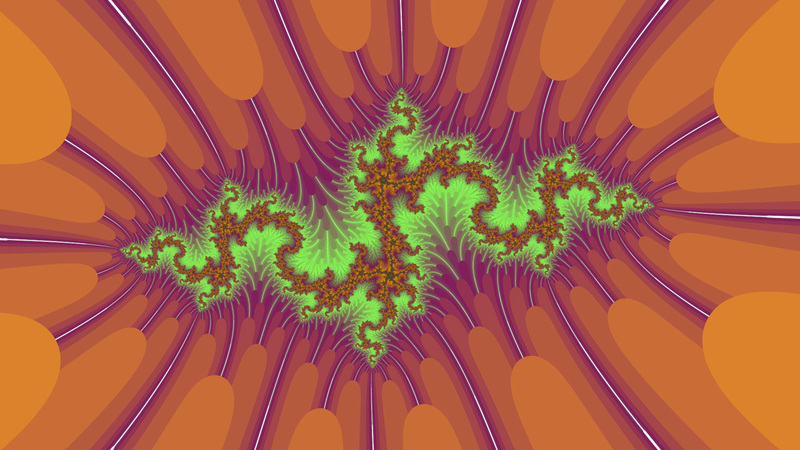 Zoom Out: This button allows you to zoom out of the fractal. This should not be used as the primary navigation system as it is intended for minor adjustments only. Left, Right, Up, Down: These buttons allow you to navigate throughout the fractal. They should not be used as the primary navigation system as they are intended for minor adjustments only. Reset: This button will reset all values in the navigation groupbox to default values. This is useful when you want to reset your fractal back to default but keep the rest of your settings. Aspect Lock: Enabling this button will force the fractal to a 1:1 aspect ratio, thereby eliminating would- be distortion from varying width and height image resolutions. This feature forces Fractus to make coordinate adjustments which therefore results in close, but not exact entries. If this feature is disabled, Fractus will use the exact coordinates entered disregarding any aspect ratio compensation. Load: This button allows you to load pre-saved fractal coordinate files. 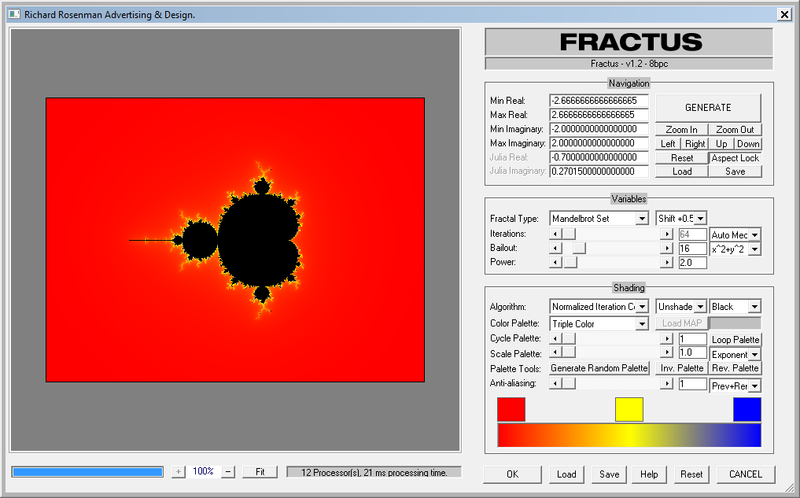 Save: This button allows you to save the currently specified fractal coordinates. Please note that this saves ONLY the coordinates and no other values. This section controls the type of fractal algorithm to use, iteration limits, bailout styles and exponential power of the fractal. Fractal Type: This dropdown specifies the type of fractal to generate. 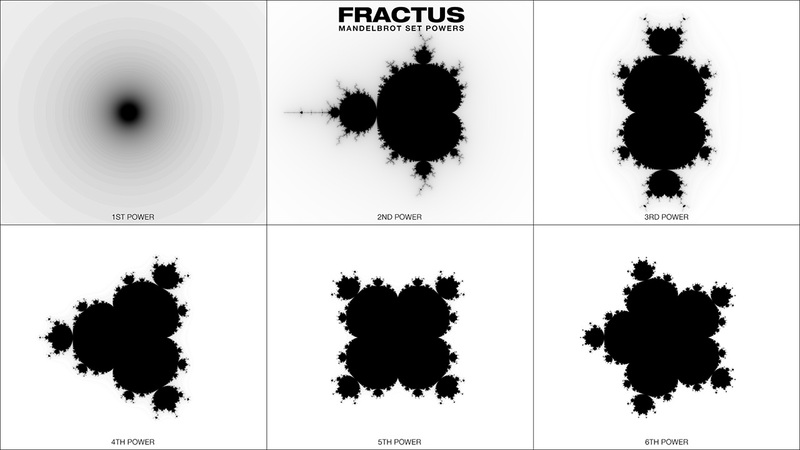 Fractus currently supports the Mandelbrot, Julia, Burning Ship, Tricorn, Inverse Mandelbrot, Inverse Burning Ship and Inverse Tricorn fractals. Selecting the Julia set will enable the Julia set constants in the navigation groupbox. 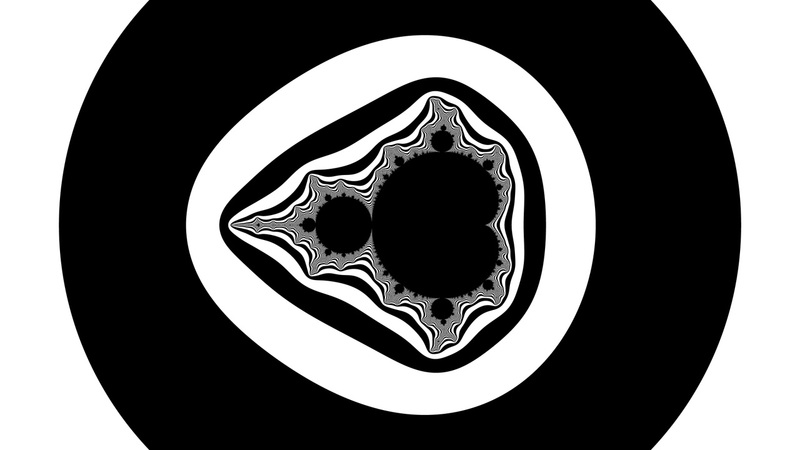 Shift: This button is useful for centering the various kinds of fractals. Because the Mandelbrot centered at its zero position appears shifted to the left due to its shape, you can center it with a positive shift. 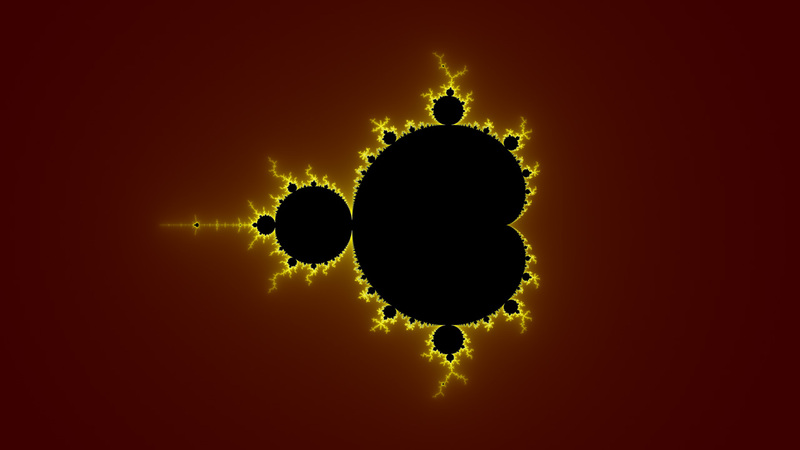 Likewise, the center position of the Mandelbrot set with higher powers or various other fractal types can be shifted to center by using a negative shift. 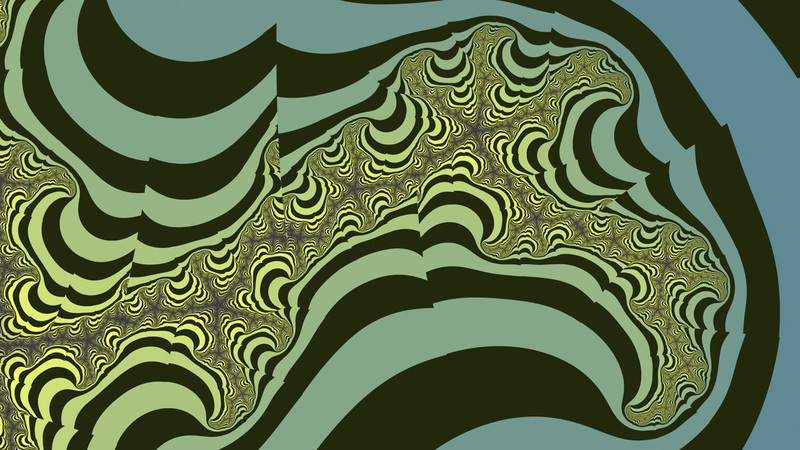 Iterations: This slider specifies the number of times to iterate the fractal. 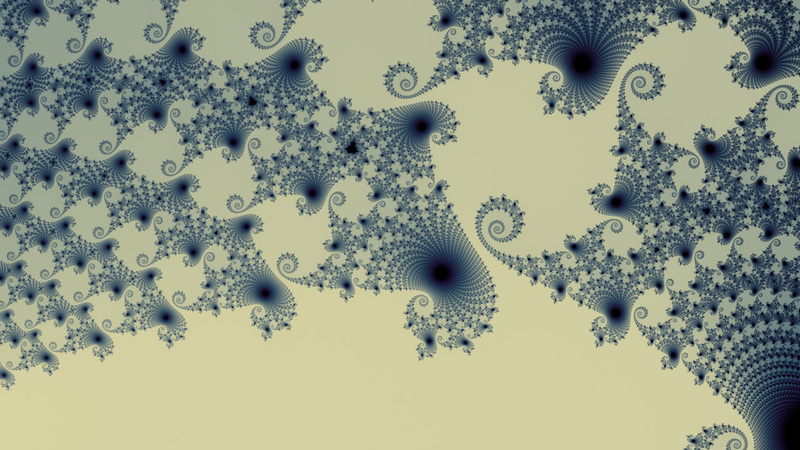 The number of iterations used in fractal calculations directly affects the shape, detail and form of the fractal. It can be thought of as the fractal resolution. Sometimes you will prefer lower iteration values while other times higher ones will be necessary. In addition, some coloring algorithms such as the normalized iteration count work better with lower iteration values while others such as the escape time algorithm work better with higher ones. It is recommended you try a fractal with various iteration counts until you find the perfect one. Auto Iterations: This dropdown specifies whether to use automatic low, medium, high or manual iteration settings. This feature allows you to continue zooming in or out and have the iterations automatically adapt themselves to your zoom level. Deeper zooms will require higher iterations and vice-versa. Since fractal exploration greatly relies on finding the perfect iteration count, it is recommended you try different values once you find a fractal you like. Bailout: This slider specifies the fractal bailout (escape radius). 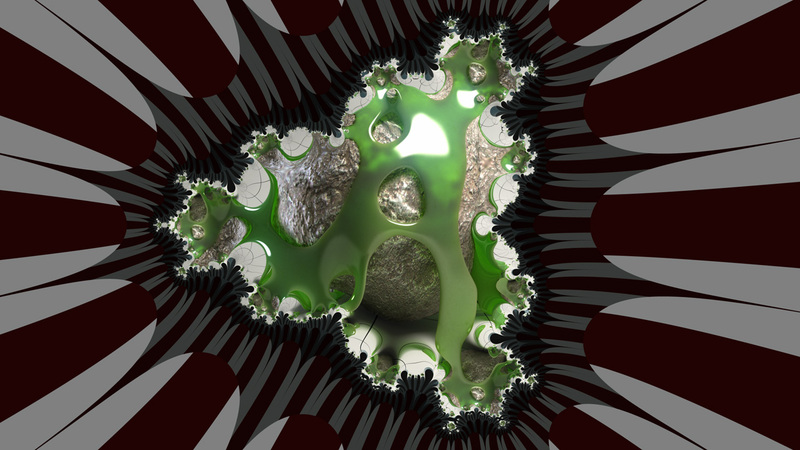 A greater bailout will often reduce artifacts in the fractal, especially when dealing with different types of coloring algorithms. The binary decomposition, level set method and absolute coloring algorithms are directly affected by the bailout value and bailout algorithm type (below). Bailout Algorithm: This dropdown menu specifies the bailout condition type. These options create unique and dramatic effects based on the different types of coloring algorithms. Although the normalized iteration count algorithm will result in barely noticeable changes, the rest of the algorithms will produce spectacular coloring effects based upon the bailout condition selected. Power: This slider specifies the fractal power. Changing the power exponent from the default value of 2.0 will require additional lengthy calculations that may affect performance. 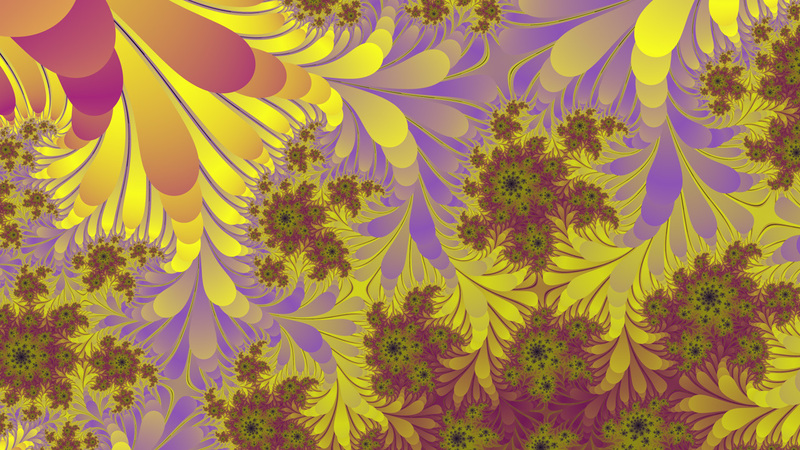 This section defines how to color the fractal. 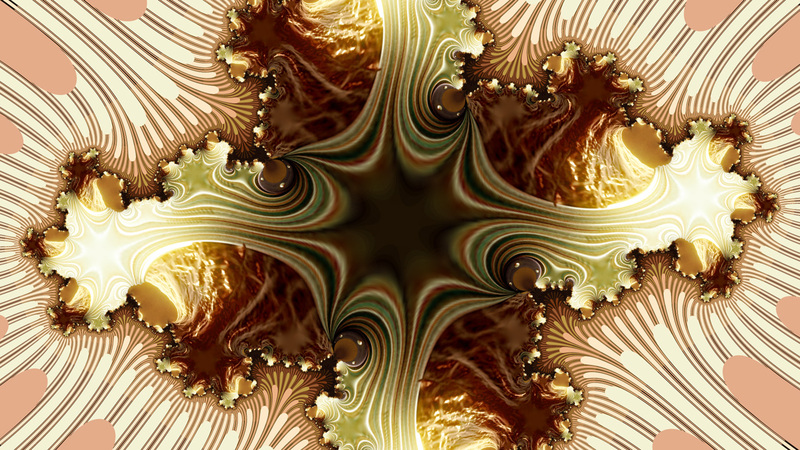 Algorithm: This dropdown specifies what fractal coloring algorithm to use. These algorithms include the normalized iteration count, escape time, binary decomposition, level set method and absolute Z. 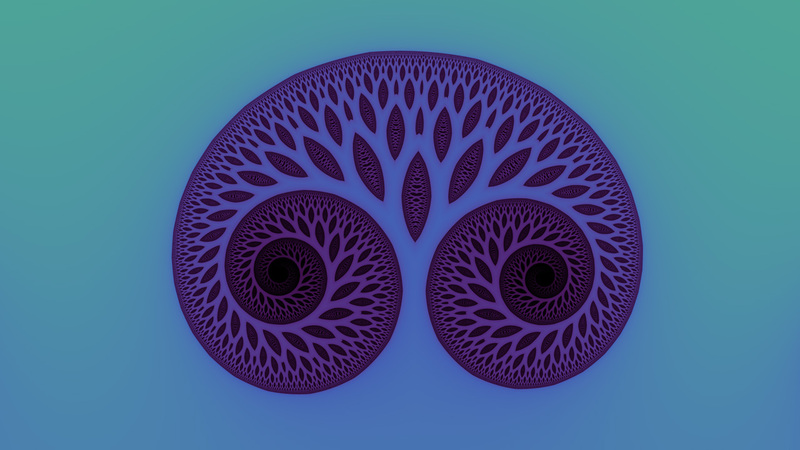 The normalized iteration count algorithm is a newer coloring technique that generates fractals with completely smooth coloring. The escape time algorithm is the original fractal coloring technique that often results in banded colors but unique renderings when combined with different bailout conditions. Shelf mapping mode is a hybrid of the previous two algorithms that creates smooth shading within each color band. The binary decomposition algorithm results in rectangular color patterns that are often displayed in black and white. The level set method results in striped color patterns that are often displayed in black and white. The absolute type results in spiked color patterns that are often displayed in black and white. When any of the last three modes are selected, a color swatch will become visible next to the algorithm dropdown box. This swatch defines the color of the patterns created by the different bailout algorithms, or as we will call it from hereon in, the algorithm color. It is useful to have an algorithm color so that you are not restricted to using one of the three colors provided for palette generation. Anti-aliasing is highly recommended when using any of these last three modes. 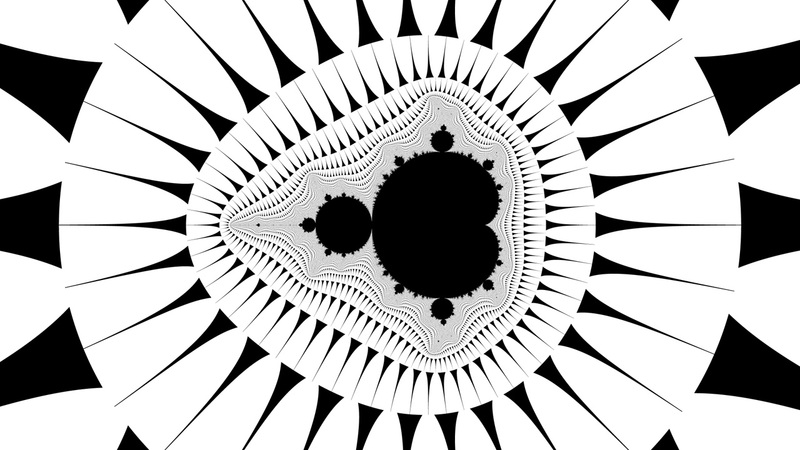 Shading: This dropdown specifies the type of shading technique to apply to the fractal. 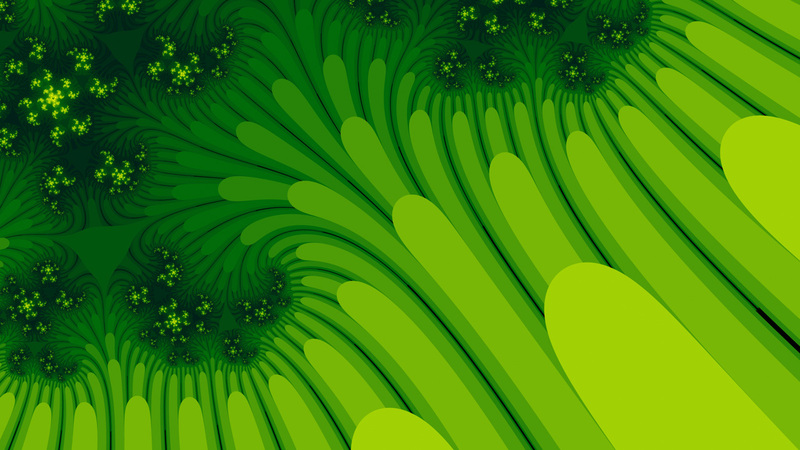 Shading is usually necessary in single color mode so that finer fractal detail can be seen. Shading also provides a smoother fractal coloring system but can sometimes hide interesting color changes occurring near the fractal interior. 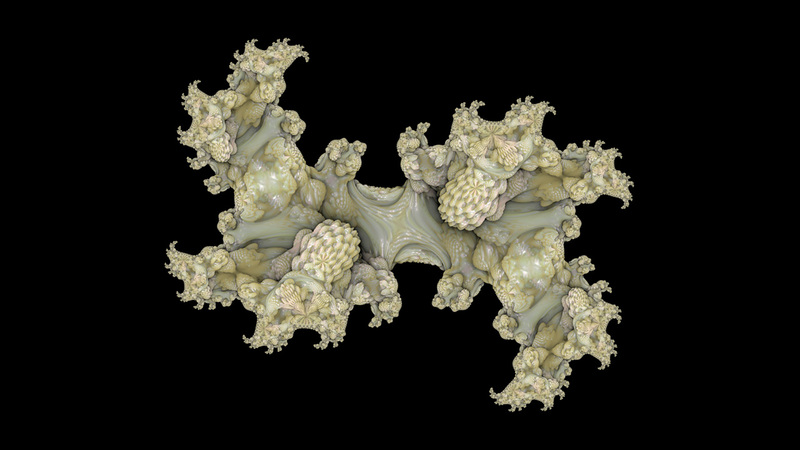 The default unshaded mode will not apply shading to the fractal. Shaded mode will apply standard shading based on the fractal iteration count. Shading inverted will apply inverted shading to the fractal. Shading scale will allow you to use the scale palette slider to control the shading density. Shading scale inverted will allow you to use the scale palette slider to control the inverted shading density. When in these last two modes, the scale palette mode dropdown will also be respected. Interior: This dropdown specifies which color to use for the interior of the fractal. You are able to select black, white, color A, B, or C, the algorithm color or fractal-space image mapping. Nice results occur when setting the interior color to that of the second color in double- color mode, or the third color in triple-color mode. Fractal-space image mapping is similar to orbit traps in that you can map an image into fractal space, often resulting in spectacular results, especially when used with very low iteration counts. 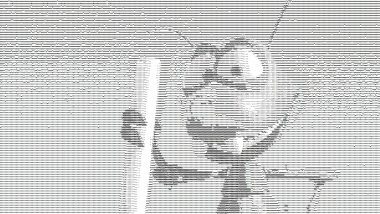 In addition, you can create intriguing effects using images with transparency as Fractus will properly compute this. 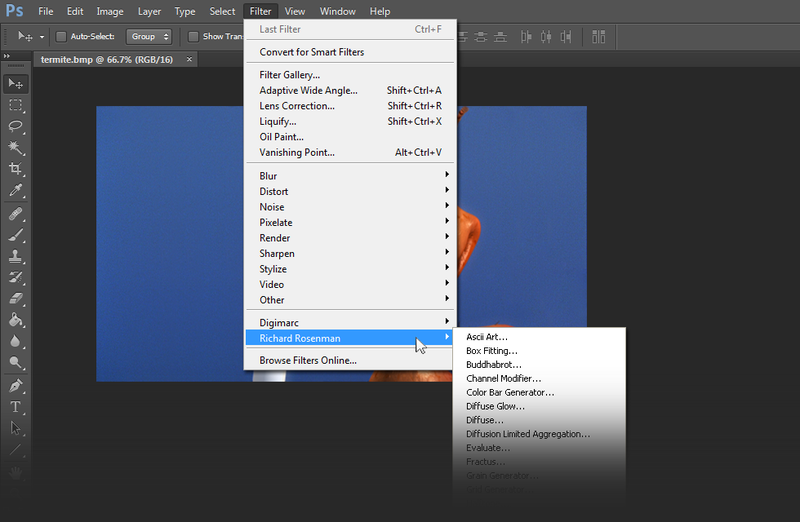 To use this feature, simply load an image into your paint program and place it on a layer that supports transparency. Now erase parts of the image that you want to be transparent revealing a see-through canvas. Having that layer selected, run Fractus and switch to fractal-space image mapping. Set your color palette to single color and you will now see the transparent parts of your image show the underlying fractal color. Since image mapping works best with a low number of iterations, set your iteration mode to manual and change the number of iterations to 10 or less. Play with other features such as other fractal types, powers and coloring modes to see different mapping results. Remember that when using transparency, Fractus will use the last color in the palette as the underlying color. Fractal-space image mapping also works well with a matching palette so create one using similar colors or simply switch your color palette to image mode. Fractal-space image mapping is a very powerful feature and can have particularly striking results depending on the image used. While all images will map accordingly, some will integrate themselves better than others based on their subject matter, color palette and composition. Color Palette: This dropdown specifies how many colors to use for the color palette, whether to use the image palette or a MAP palette file. Each time a selection is made Fractus will generate a new palette and create a gradient based on your color selection. One color will result in a palette consisting of only that color. Two colors will result in a palette consisting of a gradient from color A to color B. Three colors will result in a palette consisting of a gradient from color A to color B to color C. Image mode will force Fractus to attempt to build a palette from the current image. Since this is a complex procedure, it is sometimes difficult to achieve a good result. MAP file will allow you to import a Fractint color MAP file for sophisticated palettes. Fractus works internally in 48 bit color and only during rendertime if in 24 bit color mode, will it be scaled down. Load MAP: When activated, this button allows you to load a MAP palette file. Fractus offers the capabilities to import a Fractint color MAP file that contains 256 colors in triple RGB value format. Fractus will import this type of palette and attempt to scale it into its 48 bit color palette. MAP files provide the ability to use more than three gradients therefore allowing the creation of highly advanced and sophisticated custom palettes. MAP files are widely available throughout the internet and can also be created with numerous free applications. Filename: When activated, this box will display the currently loaded MAP palette filename. Cycle Palette: This slider will set the number of times the current palette should be cycled. It is often recommended to loop the palette before cycling it so that hard color edges are removed. Loop Palette: This button will loop (mirror) the colors back to the start. This is useful for creating a smooth, repeatable palette ready for cycling. Scale Palette: This slider will allow you to scale down the palette. 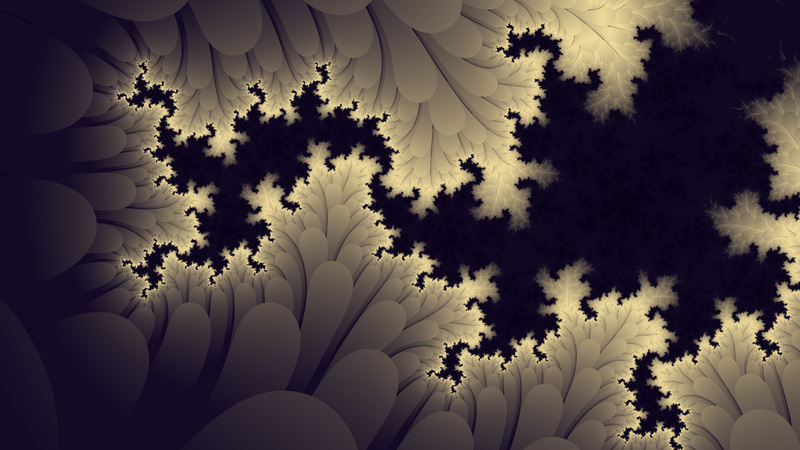 Since the colors used in the exterior of the Mandelbrot and Julia sets generally lie within the bottom of the color palette, scaling it down will result in a wider spread of visible colors. Scale Palette Mode: This dropdown defines the type of color palette scaling algorithm to use. Exponential will produce a softer falloff while linear will produce a harder falloff. Generate Random Palette: This button will generate random palettes. 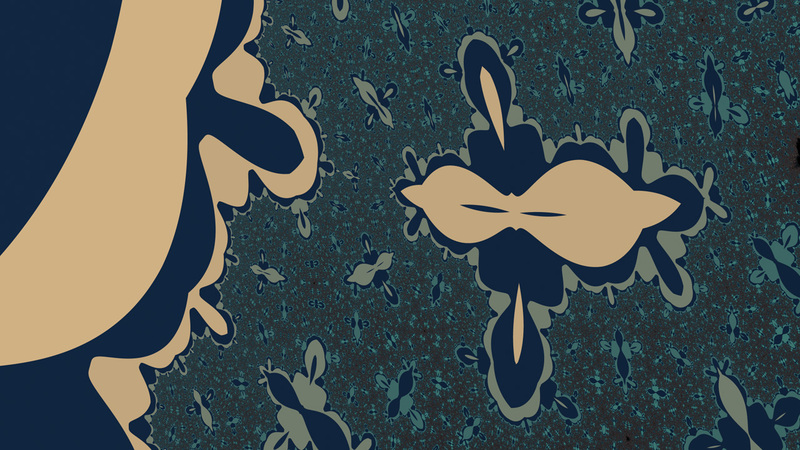 All three color swatches will be randomized with a new color. If you find a color palette you like, it is recommended to save your settings to that you can recall the palette in the future. Invert Palette: This button will invert the current color palette. Reverse Palette: This button will reverse the current color palette. Anti-aliasing: This button will perform anti-aliasing (supersampling) on the fractal. Anti-aliasing is a key component is creating visually-appealing fractal images and it should always be enabled for your final render. Anti-aliasing, also known as super-sampling, will calculate additional neighboring pixels and then sample them with the original one. 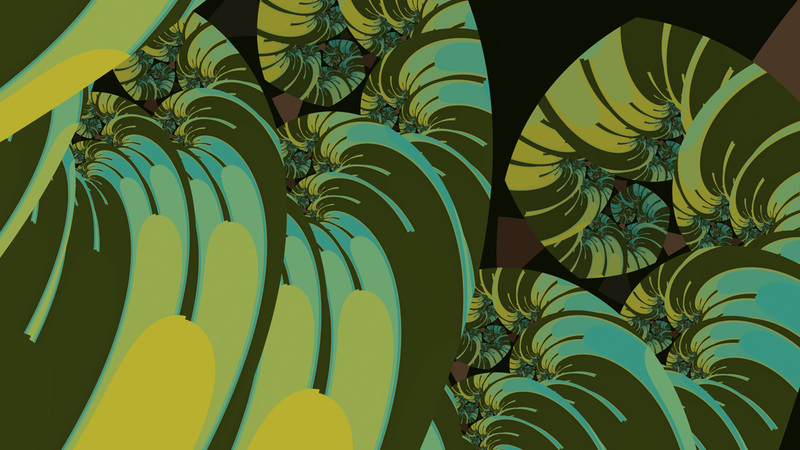 The result will be a much cleaner and more technically correct fractal. When using Fractal-space image mapping, anti-aliasing will also be performed on the mapped image requiring additional rendertime. Anti-aliasing Application: This dropdown specifies whether to apply anti-aliasing to the preview and render, or render only. Since anti-aliasing dramatically increases processing time, this feature allows you to apply it only during the final render (upon pressing OK), as opposed to your preview render as well. Color Swatches: These color swatches specify what colors to use for the color palette. Color Palette: This gradient ramp displays a preview of the current color palette. These controls deal with the general functioning and operation of the filter. Progress Bar: Displays a visual representation of the fractal generation progress. Zoom: Allows you to adjust the resolution of the preview window. Fit: This button will fit the largest possible resolution in the preview window. Statistics: This box will display the number of system cores and time used for processing. Load/Save: These buttons allow you to load and save all currently specified settings. Help: Displays this help information. Reset: This button will reset all values to default. v1.1 – 64 bit release. v1.1 – Not actually a bug, but upon entering deep-zooming (a significantly deep zoom level), arithmetic precision is required beyond that provided by floating point datasets. When this happens, the image will appear pixelated. v1.2 – Cleaned up help information. v1.2 – Fixed file access crashing bug in Windows 10.
v1.3 – Fixed incorrect logo display when using larger fonts or DPI. If you have any feedback regarding Fractus, please feel free to email me and let me know.